Thanks to unusual temperatures and rainfall, coffee production is falling in some parts of the world, just as emerging markets like India and China are embracing the drink. 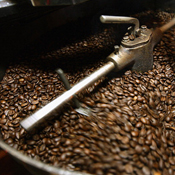 Jeremy Hobson: The price of coffee beans is above $3 a pound for the first time since the 1970s. And experts say coffee inventories are unlikely to build up in the forseeable future. Worse yet, some are saying we've reached "peak coffee" levels. Here to explain is our sustainability reporter Adriene Hill. Good morning. Hobson: So what is going on here? Why are we talking about peak coffee? Hill: Well, coffee production in some parts of the world is falling. Places like Colombia have seen their coffee production really just decline pretty dramatically since 2007. And a lot of what's happening seems to be related to weather issues. So they're seeing unusual rainfall, they're seeing unusual temperatures. These things are not good for coffee beans; especially the very finicky, the very precious arabica bean is not interested in big weather changes. And the problem is, it looks like, and some scientists think it could be related to climate change. Hobson: Climate change, so it's not a temporary thing? Hill: That's the big worry, and that's why we're talking about peak coffee. Right now, it's so concerning that some international organizations have actually turned to the United Nations and said that, hey, let's start talking about coffee crops. As you look for it, as you start thinking about climate change globally, we need to pay attention to the coffee supply. Hobson: And what is all this going to do to coffee prices? Hill: You want to guess? Hill: Up is right. Way up. So coffee production is falling at the same time that people in emerging markets like India and China are realizing just how delicious and wonderful coffee really is. And the price of coffee futures -- what the traders buy and sell for it -- has doubled in the last year. Hobson: So not good news at all for coffee drinkers. Hill: Not at all. Starbucks just upped the costs of its bagged coffee about 12 percent. Kraft announced it would bump the cost of Maxwell House by more than 20 percent. And that's just one in a series of price hikes. So our morning coffee is going to get a lot more expensive, which is bad news for me. Hobson: And me as well. And probably most of the people listening right now. Thanks Adriene, Marketplace's Adriene Hill. In"Arabica", "climate change", "coffee prices", "coffee"